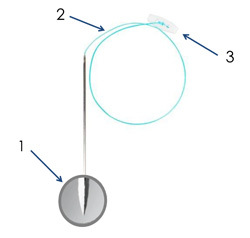 TPEA Lifter is a disposable retractor used to lift organs during laparoscopic procedures. It creates greater space in the abdomen and, improves visibility during the procedure - moving organs or tissues out of the way and, reduces the amount of devices needed in the field. Silicone stabilization device for strong, atraumatic organ suspension/retraction.